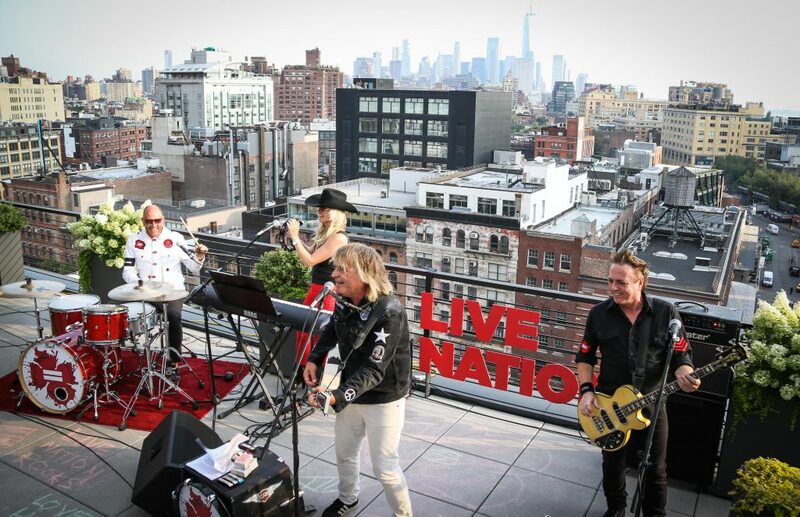 Amid tight security, Mike Peters and The Alarm performed an impromptu Beatles style rooftop concert from the top floor of the Live Nation Headquarters in New York City on August 6th 2018. 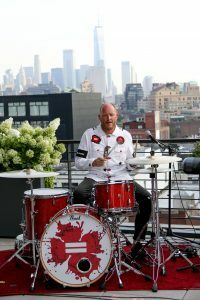 The concert was broadcast live on Facebook and attracted a huge viewership from around the world. You can watch it again here. 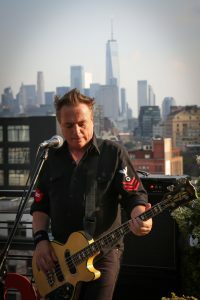 The concert broadcast opened with a power breaking performance of new album Equals stand out track – ‘Beautiful’, followed by the first of a host of special Alarm related announcements, including news of the Third Annual US Gathering which will be held at both the Gramercy Theatre and Irving Plaza, New York on April 12th / 13th 2019. Weekend passes and tickets go on sale this Friday here. 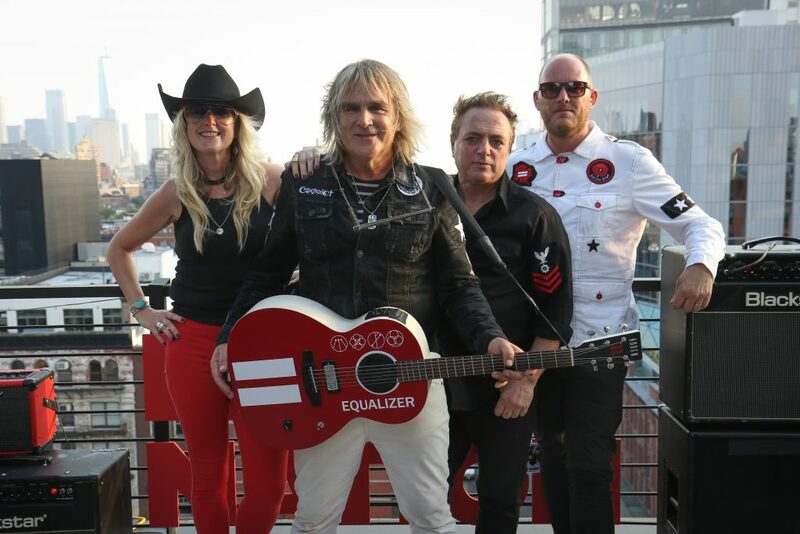 The 2019 Gathering in New York will also coincide with the April 12th 2019 re-release of The Alarm’s seminal album ‘Strength 1985-1986’ which will be made available in record stores and digital streaming services around the world on the same day, while at the Gramercy Theater itself, the band will perform a special set list based on the ‘Spirit Of ’86’ Concert to honour the release before heading over to the Irving Plaza for a massive Saturday night blow out. Alarm fans hoping to attend were advised to purchase passes in advance as all previous US Gathering events sold out in advance as have all recent NY / NJ Alarm concerts. Alarm history was represented with a rousing version of ‘The Stand’ which stood in almost perfect harmony alongside the newly born Equals track ‘Coming Backwards’. 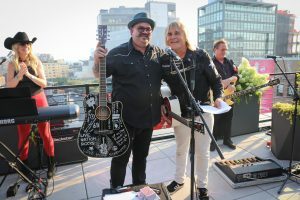 The lyric refrain of “Fighting the same battle, over and over, again and again” was echoed in Mike Peters’ descriptive monologue about the life challenges that he has had to face through living with cancer for most of his adult life. 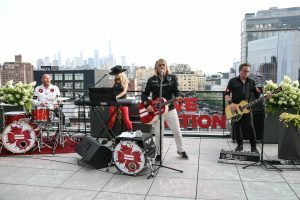 Mike Peters also described the many ‘life saving’, achievements of Love Hope Strength Foundation and presented Live Nation Executive – Sean Striegel with a signed guitar in recognition of his support and allowing Love Hope Strength to host potentially lifesaving donor drives in Live Nation venues throughout New York state. Up next, was Jason Chavez from the Love Hope Strength executive team, who had just returned from Lolapallooza Festival in Chicago, with the news that (through it’s Live Nation / C3 ambassador program), LHS had registered over 900 individuals in just one weekend. The lifesaving message was amplified as The Alarm stepped up with a glorious acoustic version of the 1985 classic ‘Strength’ which had given it’s name to the charity formed in 2007. 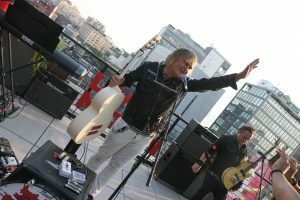 Mike Peters was then able to shed light on the Rock The Canyons trek, that is being hosted by Love Hope Strength from October 14-21st in Arizona, Utah and Nevada, and announcing that very special guests Billy Duffy of The Cult and Robin Wilson of the Gin Blossoms, will both join Love Hope Strength and The Alarm on the trek for the acoustic concert in the Grand Canyon and at the finale event in Las Vegas at the ARCIS Desert Pines. 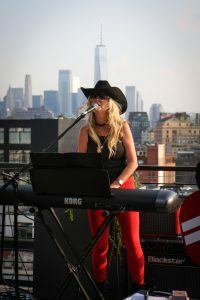 A heartfelt performance of charity anthem ‘Love, Hope and Strength’, a song that may well be able to claim the title of ‘song most performed in high places’, sounded above New York City with the Empire State Building to the North and the Freedom Tower to the south, framing this most stunning of concert locations. 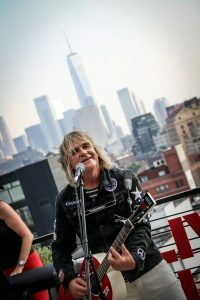 As the event drew to a close, Mike Peters announced dates for a second wave of North American Touring to run from October 25th to November 14th and also plans for a burst of UK Dates at the end of the year, before leading the band of James Stevenson (Bass), Smiley (Drums) and Jules Jones Peters (Keys), into a moving and highly inspirational performance of ‘Where The Two Rivers Meet’ that was rounded off with a medley of Alarm classics. Good nights were said, and the Equals album centric set finished with an uplifting acoustic based performance of the album’s closing song ‘Tomorrow’. The portents for the future where all there in the lyrics – “Whatever you think you are today, you can be tomorrow”. 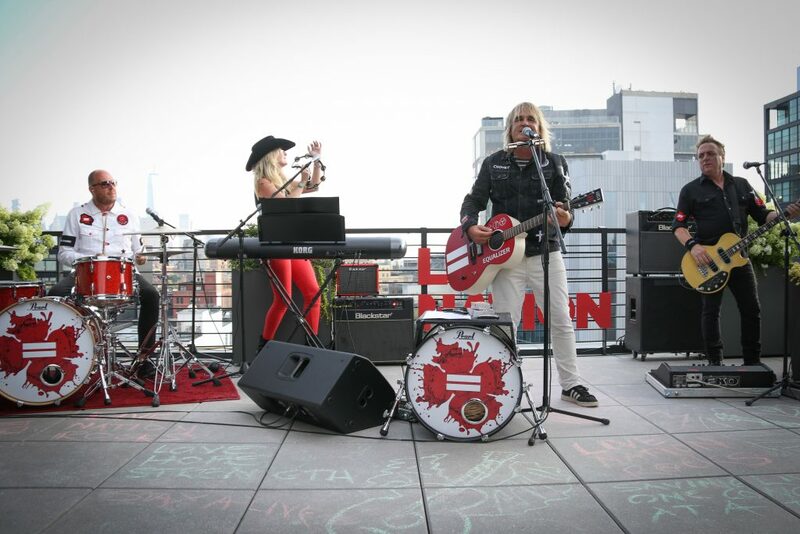 The Alarm new album EQUALS is available to order here.